We had the privilege and honor of sitting down with Tiffany to discuss focus, moxie and inspirational tips for how to produce effective change in the world. GR: It is so wonderful to talk with you! TS: Thank you! It’s so fun to speak with you, too. GR: You have shown such focus, determination and courage in your career, setting a powerful example for others. In your UC Berkeley commencement speech in 2010, you defined “moxie” as [paraphrasing] a magic potion made of equal parts boldness, fearlessness and just the right amount of outrageousness. You challenged the graduating class to take bold risks, quoting Goethe, and to live on the edge (quoting your dad). Do you think growing up as a young girl in Berkeley, California in the 1970s had a strong influence on your confidence? TS: Oh, absolutely! “Think big.” That’s what my dad used to always say. And it was also very empowering to see my mom go after her dream and get her PhD when I was a young girl. You understand it more as you get older. How rare it is to have parents that really encourage you to be everything you can be. I was also a big rule breaker. If you told me I couldn’t do something, it just made me want to do it. Don’t tell me what I can or cannot do. 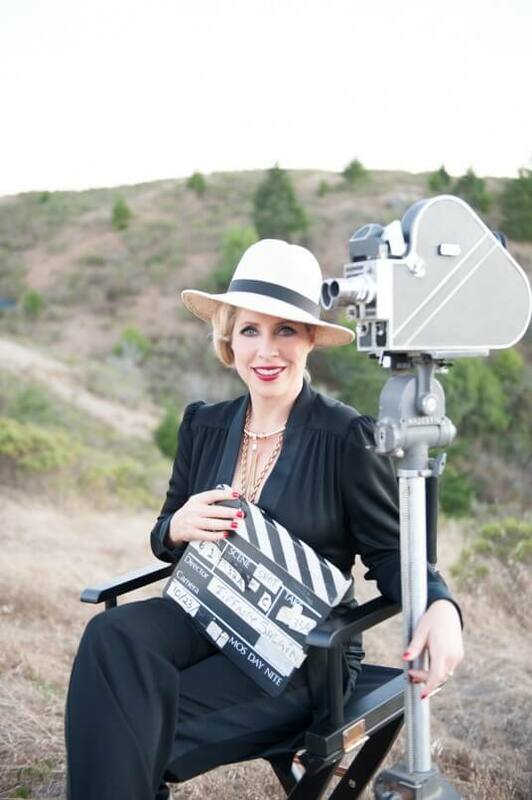 Even as a woman film director in tech, whenever somebody tells me, “Well you can’t do that,” – and I have been told that a number of times – it’s very satisfying to prove that statement wrong. GR: This is so exciting. What I recognize in both your work and Louie’s work is that you serve as powerful beacons of hope for others. You are these positive energy forces in the world. You stand for what is possible and you intentionally direct your focus to help educate your communities, your audiences, and to focus on what is good. TS: Everyone’s pointing out the worst of humanity and I feel like that’s a self-fulfilling prophecy when you only focus on the negative. The news is certainly that way. Everyone’s looking to grab people’s attention, and what grabs people’s attention is fear, so it’s all over the news. I do believe in humanity and I believe we’re evolving. It’s two steps forward, one step back. If we can highlight where the good is and where we are moving forward, it kind of pulls it all along. I think it’s needed. I’m just starting this new film right now about women in power. I feel like the story of women is often told from a place of scarcity. We’re not this; we’re not that. If you keep telling the story from that perspective, it is a self-fulfilling prophecy, too. I want to try to retell the narrative of women in history, and where we are today, and where we’re going that is much more from a place of strength. It is pretty incredible. I’m a woman director and a mother. I feel very fortunate and lucky to be alive right now. How do we highlight what is working to lift everyone up and move forward? GR: I love that. And both you and Louie enjoy audiences that welcome your message. How do you effectively reach those people for whom this is a new idea? To those for whom technology is scary, and the idea of moxie, courage, and speaking your voice is scary? TS: I feel like courage is like a muscle that you have to keep exercising, taking baby steps to get stronger. If you focus your attention on something like courage, or speaking up, or having a voice, perhaps start with the smaller step of speaking up within a small group or inside a classroom. There are so many small steps you can take to strengthen it. When I see someone that inspires me, or I love the way that they’re speaking so freely, or courageously, that inspires me, and hopefully others, to follow. Even the word “movie” contains the active word “to move.” Movies inspire us to feel, to think, to do, and hopefully to act. In most of my films I want you to think about something differently, that will make you act differently, that will make us hopefully evolve as a global community. When I made Connected, I thought about what I could contribute, which was to show a loving and supportive family dynamic. The greatest responses I received were from both men and women who found inspiration and healing. It became a positive message about what is possible. I think that a bigger story and bigger narrative are so important. Most of my work is really about processing the world myself. I’m always wanting bigger context and when I go to a bigger context I usually find hope and gratitude. [The 70s were] such an interesting time to be brought into this world because there was so much change. Living through the first web boom when I was starting the Webby Awards also felt like an incredibly exciting time of social change with the introduction of the internet connecting all of us. GR: I’m not sure we’re passing on the urgency to our own daughters that our mothers drilled into us because it feels so much safer these days. I wonder if we’ve diluted the message a little just because it doesn’t feel quite as urgent as it was for our mothers. TS: That’s interesting. I suspect the young women of today are not feeling the fight. They’re feeling equal and they don’t realize that we’re not yet. My first film with Sundance was on reproductive choice and I’m very verbal about my frustration with the topic. GR: Loved that, and I also loved your film, The Making of a Mensch! TS: Oh, thank you. I want to reclaim that word “mensch” for women. GR: There are so many things that I want to ask you about, but I’d love to hear you expand upon a statement I’ve heard you say a few times regarding the practice of naming your hopes and your dreams, declaring them out loud as a way of manifesting them into reality. What are your current hopes and dreams? TS: Hmmm… Well, Character Day will be our third annual event. That is a dream come true. We’re living in such a busy world and we’ve created this one global day where we let people show our films like The Science of Character, The Making of a Mensch, The Adaptable Mind, provide free discussion kits, and an online conversation where everyone can talk about who they are and who they want to be in the world. It started as an experiment and it’s really grown. Last year we had over 6,700 screenings in 41 countries and events. It’ll be even bigger this year! So my hope and dream is that your community will want to be engaged. It’s very easy to sign up. It’s free. And just for one day we’ll give you all these great resources to really surround yourself in this thinking about all this new research on neuroscience and social science on who you are and who you want to be. With subjects that resonate with Louie as well, like gratitude, and empathy, and generosity, and courage, and how do you build those in yourself. We’re really trying to create a global conversation around this question of character. That’s one thing my team’s working very hard on making this a powerful and meaningful experience with many diverse perspectives. Then I’ve just started this film on women in power called 50/50 and it’ll be out this fall. Refinery29 is doing a series with women directors on the dynamics of power, my specific film in the series will looking at the past, present, and future of power with women. Refinery29 will be releasing my film in October and we will also be premiering it live at an event that we’re just finalizing now. GR: That’s exciting. Will you update us when the details are finalized? TS: Of course. Character Day is September 22nd and then the premiere will be some day in October. GR: I never hear you talking about money. It always seems like you just want to make this stuff available to the world and somehow the money will just work itself out. TS: That’s right. If you’ve got the dream, the money will follow. I am such a believer of that. You have a good idea. You’re not asking. You’re inviting, “Do you want to come along and support this?” It’s coming from a place of abundance. I have to say that strategy has worked so far for me. I love taking an idea, growing it and doing the research, bringing on the right team, and then giving it out to the world and having them engage with it. There’s nothing more exciting to me. GR: That ties in with this idea of declaring something and having it manifest. It seems like there’s this “YES” bubble around you. You have a serious track record for asking for pretty outrageous things and having a resounding positive response. TS: If you have an idea, and you believe in yourself, and you surround yourself with others who support you and push you, then it would be a shame not to “go for it.” Go for it as if you know it’s already done. Pursue it with clarity and focus and commitment, and just see what unfolds. UPDATE, October 30, 2016: The film 50/50 has launched and been incredibly well received. Here it is – 20 minutes in length – for our viewers to enjoy in full! She has premiered four films at Sundance, including her acclaimed feature documentary Connected: An Autoblogography about Love, Death & Technology, which The New York Times hailed as “high-tech Terry Gilliam,” and “Examining Everything From the Big Bang to Twitter.” The US State Department has also selected four of Shlain’s films including Connected to represent the U.S. at embassies around the world for their American Film Showcase. Her AOL Original series, The Future Starts Here was nominated for an Emmy in New Approaches: Arts, Lifestyle, Culture and has over 40 million views to date. Shlain’s films employ her signature style of fast-paced images, colorful animations, and daring and funny insights to encourage us all to think about where we’re headed in our increasingly connected world. Tiffany is a world-renowned speaker and has been featured at Google, Harvard, NASA, The Economist Ideas conference and was the closing speaker for TEDWomen and TEDMED. Tiffany was the on-air Internet expert on ABC’s Good Morning America with Diane Sawyer, is a Henry Crown Fellow of The Aspen Institute, is an advisor to The Institute for the Future, and was invited to advise then Secretary of State Hillary Clinton about the Internet and technology. She has contributed articles for Harvard Business Review, Documentary Magazine and was listed by Indiewire & FastCompany for her writing on twitter. TED Conferences published her first book, Brain Power: From Neurons to Networks, and she has been writing a quarterly newsletter about ideas and culture since 1998 called Breakfast @ Tiffany’s. She runs film studio + lab called The Moxie Institute and a nonprofit Let Ripple: Mobile Films for Global Change that makes free films for schools and creates global events to catalyze conversations around important topics. Her films have been translated into multiple languages and had over 50 million views. This past fall they just hosted their 2nd annual Character Day that had over 6700 screenings globally of two new films: The Making of a Mensch & The Adaptable Mind. She and her team just received grants from The John Templeton Foundation and Steven Spielberg’s Righteous Person’s Foundation to expand their efforts with Character Day and outreach for Making of a Mensch. Character Day 2016 is set for Sept 22nd. Tiffany lives in Northern California with her husband and collaborator Ken Goldberg (an artist & professor of robotics at UC Berkeley) and their two children. Her films and work often wrestle with the good, the bad and the potential of technology. She and her family are on their 7th year unplugging each week for 24 hours as part of their “technology shabbats,” which she has written about, given talks about and explores in many of her films. Wonderful, as always, GR and Louie. Thank you!